Screen shot courtesy of Social Work Helper. 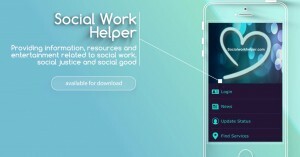 The popular Social Work Helper progressive news website is offering a app that will help connect social workers and people in need to resources and services. Deona Hooper, MSW, founder and editor and chief of the publication, explained why the app. was created. Cheers to Social Work Helper for providing this service. You can watch a video explaining the app here. Android users can download the app here and iPhone users can download it here. I was unable to locate the app. Ideas about what I am doing wrong? Sorry about your issue. Please contact app creator Deona Hooper at deona@socialworkhelper.com.